One great thing about the wedding world is I’m not in it alone. I get to meet and work with all types of wedding vendors. Recently, I’ve been able to team up with the Diamond Center for this Special Engagement Session Offer. If you buy an engagement ring from the Diamond Center, you get either proposal photos or an engagement session from me! I’ve already shared Ben and Ashley and Haley and Brock. 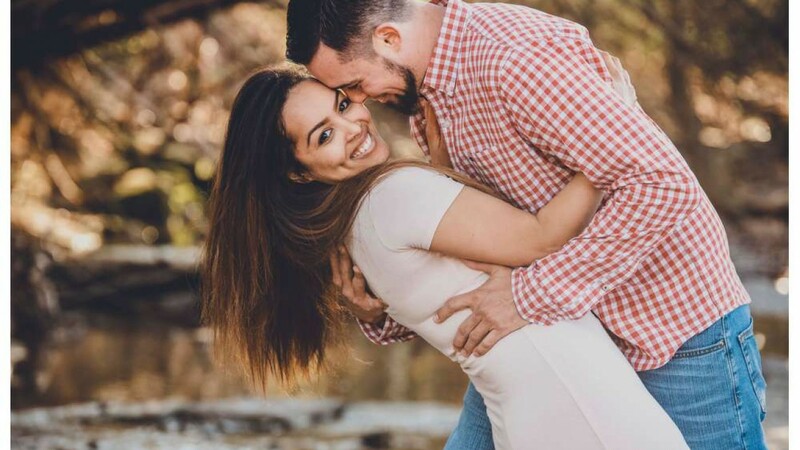 Now, check out Stephanie and Mike’s engagement photos. One of the really interesting things about these special engagement sessions is that I really don’t know anything about the couples, and they really don’t know much about me. That means we both get to learn a lot about each other. I’m sure it’s much more stressful for the couple not knowing me since they will be in front of the camera. Stephanie and Mike were awesome, though. After like 3 minutes, they were laughing and having a good time and I learned a lot about them. The first thing I asked about is their jobs because that can tell me a lot about them. Mike is in the tech world and Stephanie was some form of military police. Those seem like totally opposite worlds, but these two really work well together. Mike likes to make jokes and Stephanie likes to laugh. I think about half of the photos have her laughing. I also found out a bit about their wedding. They are getting married in Texas in October. I don’t recall the name of the venue, but it’s a peach orchard. The only problem…no peaches in October. We joked about hanging up some peaches or photoshopping them in (Yes, I could actually do that). One of the other things I do during these engagement sessions is I interview them and create a video. This way, the Diamond Center will have something to easily share. I’ve been amazed at the things I’ve heard about the Diamond Center from these couples. The thing that keeps coming up again and again is how nice they are and customer service. That’s probably why their business is so successful. This last weekend, I actual photographed another one of these sessions for the Diamond Center (a proposal!!!!). I don’t know when the next session will be, but I’m really looking forward to it. If you know someone that is looking for an engagement ring, send them to the Diamond Center for this Special Engagement Session Offer. They can get the perfect ring and get a free engagement session!